A bit of an update on new openings we've spied around Sydney. It's only the start of the year and so many new places to try. While some places are closed until the end of this week for the Lunar New Year, there's a whole bunch of action elsewhere. Sydney is in a constant cycle of openings, closings and redevelopments, it's becoming hard to keep up with them all. Here's a few new places we've spied. New to The Quay development in Chinatown is the Korean resto The Bab Zip. Just inside the entrance way to Tong Li Supermarket, it's a bibimbab, dup bab (a rice bowl with toppings that aren't as fancy as a bibimbab) and hot pot kind of place. 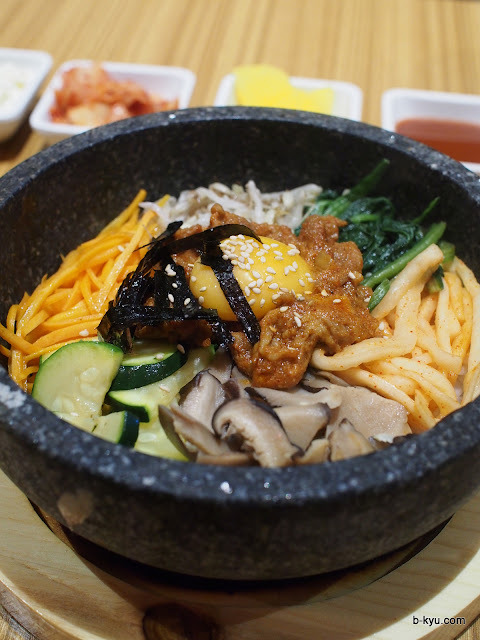 The most interesting touch is a buffet, currently only $13 eat in or takeaway, a quick spy down the line showed beef bulgolgi, noodles, tofu and fish in the bain-maries of love but our pick is the menu items, the food in the warmers looked a little drab. There's no KFC yet. Currently BYO beer and wine. Taprobana has opened in the circle of shops near where the old Motor Registry was housed. We've worked our way through some veggie curries and a chicken biryani and will try out their made to order lampries soon. There's not many Sri Lankan places on the city side of Homebush so this makes a change. We've always though that the food courts in Chinatown would be a ripe place to trial a food business, especially if you didn't want to drive around a truck. Ghostboy Cantina is preparing to shake up the Asian centric food stalls down in the mirrored wonderland of Dixon House, taking over the long empty Korean food stall opposite the bar. We hope that fusion style tacos will be enough to keep it going. Parsi Traditional Persian has opened on the unloved side of Merrylands shopping centre. While it's hard to get us to deviate from our beloved Kebab Al-Hojat, we'll be investigating this new place soon. Walli Asr has expanded to a shop across the mall with a full range of halal fresh meats and gussied up their grocery store to create a little arcade empire. There's also another new place along Pitt St in development, by the looks of the wooden cladding on the outside walls it might be Chinese. The Billabong Hotel has had a bit of a makeover if you fancy a schooey before your feast. New in Enmore, Sheila Tandoori Indian, has recently opened up near Sultan's Table. The menu looks worth a shot with a number of biryani dishes, goat masala, Bengali fish curry and a whole chicken marinated and cooked in the tandoor. Sultan's Table has re-opened, hurrah! A brand spanking shiny new exhaust system was installed and they are back in business. On the horizon, there's new Indonesian coming to Chinatown and a northern Chinese style snackery opening near the fast disappearing Ent Cent. That's all the news that's fit to eat.